The town of Kamiros was founded by the Dorians, just like lalyssos and Lindos and its located 37 km / 23 ml from Rhodes City on the west coast of the Island. 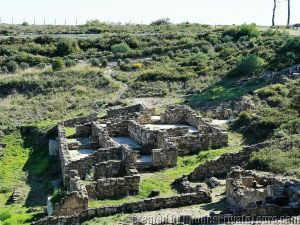 The first signs of habitation in the wider region date back to the Mycenaean era. In prehistoric times the Mylantian gods (Zeus Mylantios and Himalia), who taught mankind milling and kneading, were worshipped here. 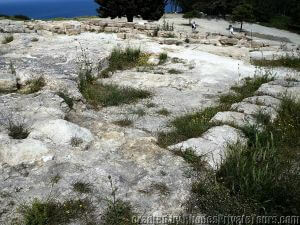 Kamiros was gradually abandoned by its inhabitants and slowly buried by the earth itself with the passage of time. 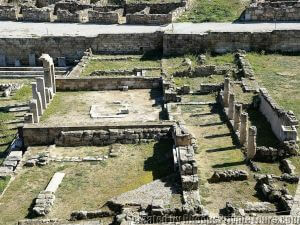 The city was built over the ruins of an older settlement after the earthquake in 226 BC and is a characteristic example of Hellenistic urban layout and design, with its division into zones of public and private buildings. 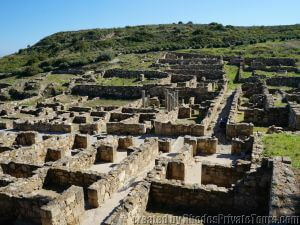 The ancient city was built on three levels, each with a distinct purpose - worship, settlement, trade. The remains of the temple of Athina. Only its foundation has survived, was a tetrastyle peripteral with porticos on all four sides, was surrounded by a peribolos. The remains of the two rows of Doric columns of the Hellenistic Stoa. 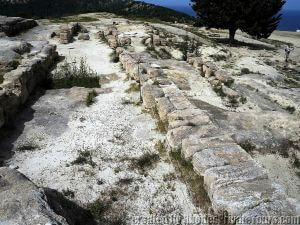 The Stoa had the shape of the Greek letter Π and was 200 meter / 700 feet long. 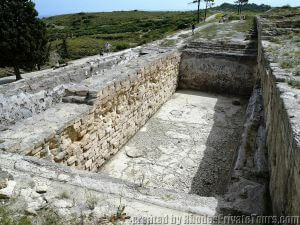 There was an impressive water supply system under the floor with wells, subterranean tanks and terra-cotta water pipes. 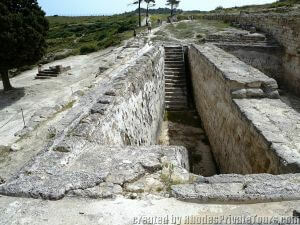 The Archaic Cistern (Water Reservoir). A rectangular construction lined with plaster. Terra-cotta pipes and two apertures with stone covers on the bottom served to carry the water to the settlement. It had a capacity of 600.000 liters / 158.503 US gallons of water, a reserve sufficient for 300-400 families. Steps on the sides facilitated access to clean the reservoir, which was covered. 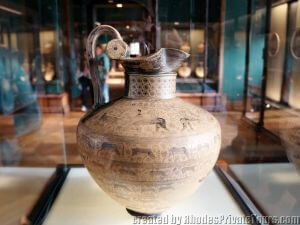 It dates to the 6th-5th c. BC. 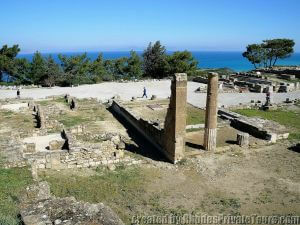 In the Hellenistic period its place was taken by the Stoa, which put it out of use. The city built according to the Hippodamian System with a grid of parallel streets and residential blocks of the same size. (Hippodamus of Miletus 498 – 408 BC the “father” of urban planning). Its arrangement around the natural slops of the hill to right and left of the main street linking the lowest level with the acropolis. A principal feature of the houses was the interior colonnaded courtyard with one side usually higher than the others. They were adorned with mosaic floors and facades with architraves and painted decoration on plaster. The Doric Temple. 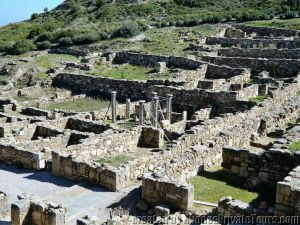 Located on the third and lowest terrace of the archaeological zone at the north west edge of the Fountain Square. 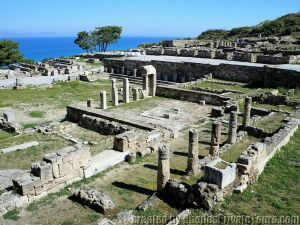 It was a poros distyle temple (having two columns in antis at the front), with a pronaos, cella and opisthodomos. It was probably dedicated to Pythian Apollo. Contrary to Lindos, which had a great naval tradition, Kameiros was by and large a rural society whose main products were olive oil, figs and wine. The need to export these products was the stimulus for the creation of a major ceramics industry. 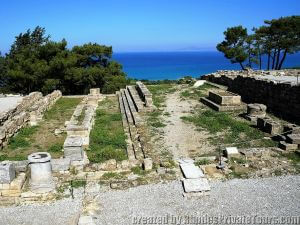 The town reached its greatest height in the 6th century B. C. which has been determined by the pottery that was found, in addition to the fact that during that same century Kameiros was the first Rhodian town to mint its own coins. 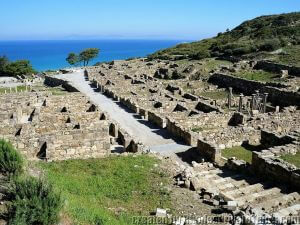 After 408 BC (founding year of Rhodes Town) Kamiros went into decline and it vanished forever in the 2nd century AD. 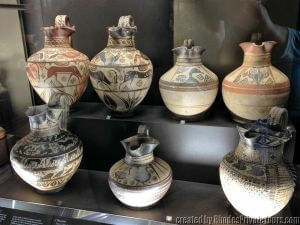 Many potteries and unique artifacts found during excavations on the Island of Rhodes (from the 19th century until today) great samples of the ancient Rhodian art. Most of them are now scattered in different Europeans museums such as the British Museum in London, the Louvre museum in Paris, the National museum of Denmark and the National museum in Berlin.